In preparation for the Daniel 11 Prophecy Conference I want to make it easy for you to find all my material on Daniel 11. Just click here to be directed to my August 24, 2015 post where I maintain an up-to-date index of everything on this site related to Daniel 11. That's right. You no longer need to type klebrun.blogspot.com. From now on all you have to do is type thougthlines.org into your browser. I don't know why I didn't realize I could assign a custom domain name to this blog. Anyway, I hope you appreciate it. Some of the linked files in my blog posts are on a server that no longer allows public access. I apologize for that. I plan to get around to fixing that eventually. But in the meantime, if you click on a link and it doesn't take you there, let me know in the comments and I'll fix it for you. "But he that cometh against him shall do according to his own will, and none shall stand before him: and he shall stand in the glorious land, which by his hand shall be consumed." 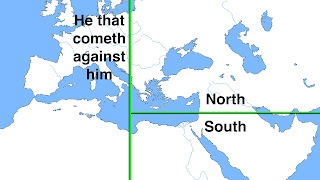 Most non-Adventist commentaries consider Daniel 11:16 to be a continuation of the narrative in verse 15, referring to Antiochus III the Great, who militarily wrested Palestine from Egyptian control. Adventists, on the other hand, have traditionally viewed verse 16 as the grand entrance of Rome into the prophecy by its defeat of the Seleucid kingdom. The expression "he that cometh" is applied to Rome, and the "him" against whom he comes is the Seleucid king. Counter to the mainstream Adventist interpretation, Dr. Roy Gane of Andrews University has pointed out several reasons for delaying Rome's introduction until verse 20. His work is cited in my last post, where I provided fourteen reasons in favor of Dr. Gane's application of verses 17-22. In today's post, however, I will argue in favor of considering verse 16 to be a parenthetical preview describing Rome. It largely boils down to the correct identity of the first instance of the word "him" in the verse. As usual, the masculine singular personal pronoun is here indicated by a pronominal suffix attached to the Hebrew word for "against." This must necessarily refer back to a masculine singular antecedent. Several of the nouns in verse 15 are either feminine or plural, or both, eliminating them as grammatical candidates. 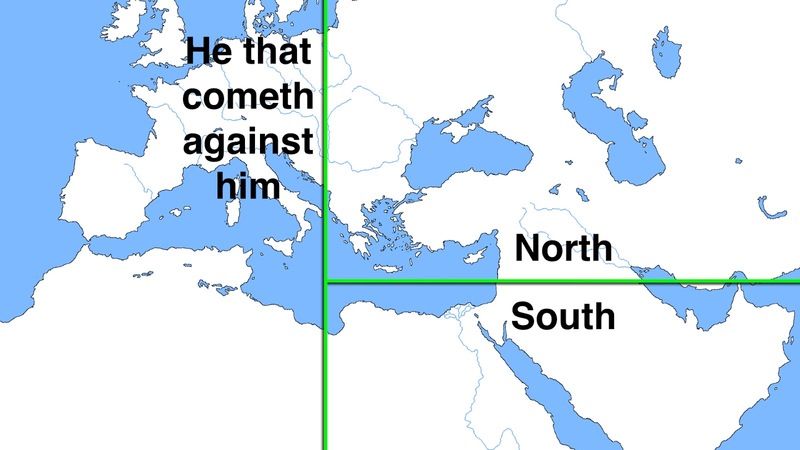 Only through some sort of literary personification of the "south" in verse 15 is it possible to produce an antecedent that would allow one to apply the "him" to Egypt, which is necessary in order for "he that cometh" to be Antiochus. But an easier antecedent for the "him" is the word "king" in verse 15, which doesn't require us to jump through any literary hoops, for one would naturally assign to a king the masculine singular personal pronoun "him." This natural reading of the text favors the king of the North as the one being attacked in verse 16, rather than being the attacker. It is clear, therefore, that verse 16 must be tied in some way to verse 15. Considering all the factors involved, I would like to suggest that the relationship of verse 16 to verse 15 is a relationship of comparison rather than of continuation. All that Antiochus the Great accomplished in verse 15 would be exceeded immensely by the power that comes against him. Verse 15 boasts that when Antiochus comes, "the arms of the south shall not withstand." But verse 16 presents the comparison, declaring that "none [nobody at all] shall stand before" the power that comes against Antiochus. Perhaps the best explanation for the lack of a major break or transition in the text after verse 15 is that Antiochus' story, in fact, does not end here; it only experiences a momentary interruption for a brief parenthetical comment for perspective. Yes, Antiochus did capture Judea. But he that cometh against him would do according to his own will, and none would stand before him. This new invader would also stand in the glorious land, which by his hand would indeed be consumed. This brief preview introduces Rome, a new power, into the prophecy, which would ultimately annihilate Jerusalem. 1. The phrase, "shall do according to his own will," indicates that this power is not bound by any existing circumstances. The expression may appropriately be applied to the development of a new power on the prophetic stage, as William Shea has pointed out. Daniel: A Reader's Guide (Nampa, ID: Pacific Press Publishing Association, 2005), 246. Applied to the great empire builders Cyrus (Daniel 8:4) and Alexander the Great (Daniel 11:3), the phrase just doesn't seem to fit a struggling Seleucid who is about to surrender the prophetic spotlight over to another empire that is truly worthy of the expression. 2. It is certainly not true that "none shall stand before" Antiochus III. For when he came into confrontation with Rome, Antiochus could not stand. 3. As a result of conquering Palestine, Antiochus III did stand in the glorious land. But that is about as far as we can apply the verse to him. The word "consumed," meaning complete destruction or annihilation, is too strong of a word to describe Antiochus' relation to the glorious land. He was actually fairly gracious to the Jews. 4. If nearly one fourth of the entire chapter, ten verses (verses 10-19) out of forty-five, involve the career of Antiochus III, that would assign to a single individual a stature without equal in Daniel 11 or elsewhere. Even Alexander the Great, the only prominent individual in Chapter 8, gets only two verses in Chapter 11. Ascribing the superlative declarations of verse 16 to Antiochus III places far too much relative emphasis on this insufficiently worthy individual. For these reasons, Rome fits the description of verse 16 much better. But how it happened that this newly emerging empire in the West could end up stealing the prophetic spotlight from the successors of Alexander is a story that must be told. It was the activities of Antiochus III that lured the armies of Rome for the first time into Asia. Daniel 11:17-19 tells us all about it. After noting Antiochus' determination to expand his kingdom, verse 17 discusses the treaty he made with Ptolemy V of Egypt, pledging to him his daughter, Cleopatra I. After this, moving to reclaim the Thracian territory that his ancestor Seleucus I Nicator had conquered from Lysimachus, Antiochus turned "his face unto the isles" (verse 18), and crossed over into Europe. This alarmed the Romans, who in 191 BC declared war against him. Defeated at Thermopylae, Antiochus retreated to Ephesus. The Romans pursued, and the decisive battle was fought at Magnesia in 190 BC. The Seleucid army was vanquished. The result was that Antiochus had to surrender all of Asia west of the Taurus mountains, all of his war elephants, all but twelve warships, and agree to pay 15,000 talents, which involved an annual tribute, to Rome. Thus came to an inglorious end the great Seleucid Empire. In 187 BC Antiochus was murdered in his own homeland (verse 19) for robbing a temple to make his payment to Rome. He was the last Greek king of the North to appear in the prophecy. It is important to note that the rulers of Rome, which occupy the next ten verses (20-29), are never referred to as kings of the North. That's because their capital was in the West. From Rome they would control both the North and the South, but their identity was not to be found in either. They were of Rome, the stronghold from which they forecasted their devices (verse 24) lying beyond the dominions of Alexander's Diadochi. Rome was not the king of the North, but "he that cometh against him" (verse 16). Not until the Time of the End would the chapter's focus return to the East. For an interesting account of the history of verses 17-19, see A. T. Jones, The Great Empires of Prophecy, Chapter 19, paragraphs 30-44. I have been invited to speak at the Daniel 11 Prophecy Conference to be held October 19-20, 2018 at the Village SDA Church in Berrien Springs, Michigan. Event information is at http://www.daniel11prophecy.com. The stated purpose of this conference is "to provide a forum for the public hearing of the leading King of the South (KOS) interpretations of Daniel 11:40ff; to stimulate further study among church members on eschatological prophecy; and to raise awareness among church members of where we are in the broad flow of salvation history." While the focus of this conference is on the King of the South, that is just a convenient way of categorizing the views to be presented. Each speaker will present his position in the context of the broader interpretation of Daniel 11 as a whole. I will be speaking on Sabbath afternoon. The paper I will be presenting is entitled, "Identifying the King of the South Through a Natural Reading of Daniel 11." The full paper is posted under "Conference Papers" on the event website and is available now to read. Click here to view and download. David's royal line was preserved when Jehosheba hid the child Joash so that Athaliah the queen could not kill him. The marriage of Jehoshaphat's son to Ahab's daughter linked together the royal families of Israel and Judah. 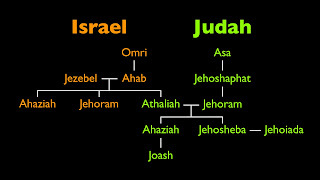 As a result, all the kings of Judah thereafter would be descended, not only from David, but from Ahab and Jezebel as well. The Bible does not say that Jehosheba was the daughter of Athaliah, but only that she was the daughter of Jehoram of Judah. Jesus' genealogy through Joseph is traced in Matthew chapter 1, showing Him to be a rightful heir to the throne of David. 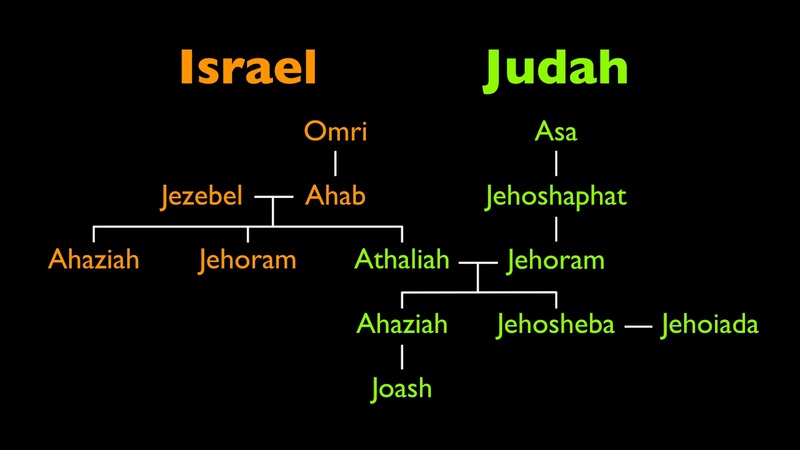 If the genealogy of Jesus in Luke 3 traces his ancestry through Mary, and if both lines meet in the same Zerubbabel (Luke 3:27; Matthew 1:12, 13), then Jesus' human blood line includes the heathen queen Jezebel. If, on the other hand, both genealogies of Jesus are through Joseph, then we have no details about Jesus' blood ancestry.